I have a new favourite Hindi word – Bhojanalaya, or eatery. And I have a new favourite Bhojanalaya – Hotel Adarsh Niwas in Old Delhi. I had lunch there yesterday with the Man with the Best Job in Indian Journalism, as part of a whistle stop tour some of his favourite Old Delhi haunts. Each place we stopped at deserves a post all to itself and will get one in due course but I just wanted to quickly share the highlights – I’ve also plotted all the places on the map above so you can get out there yourself. And you should – it’s the best time of year for walking in Old Delhi. We tumbled out of the Metro straight into Shyam Sweets for a plate of Bedmi Aloo. Bedmi Puri are made by adding ground lentils and spices to a basic dough, making the deep-fried, puffed-up bread crunchier than a normal puri. It came served with a potato curry, ‘kachaloo’, or yam and some pickled cauliflower. Once we’d cleaned our plates, we were sent off with a mouthful of sticky, sweet Moong Dal ki Halwa, rounding off the spicy, savoury Bedmi Aloo perfectly. 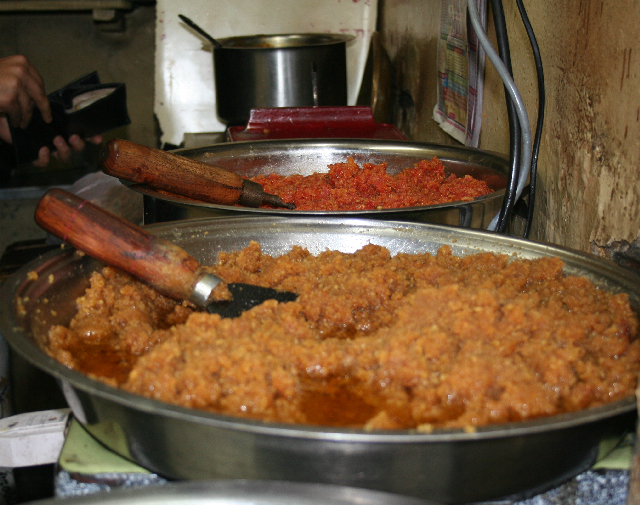 Hot, street Halwa is at it’s most desirable in the winter months and to show how much this dish can vary Rahul led me to a small gully, Kucha Mahajan, the heart of Delhi’s bullion market, off the Fatehpuri end of Chandni Chowk. Here, in a tiny hole in the wall, a family from Churu in Rajasthan make a dramatically different Moong Dal Halwa, less sweet, more nutty in flavour, apparently as a result of roasting the lentils before cooking in pure ghee. Back on Chandni Chowk, we marched a bit further towards Fatehpuri. On the corner with Kucha Ghasi Ram, Rahul pointed out ‘the best Jalebi-Wala in Delhi’ (better, apparently, than ‘Old and Famous’ further up Chandni Chowk). Certainly, the shop front, proudly boasting ‘House of Pure Desi Ghee’ looked promising. Jalebis weren’t on the menu today, however, we were looking for Milk Cake, an Old Delhi speciality made by cooking milk sugar and ghee until browned but still soft and gooey. The shop doesn’t have a name, and is essentially a tea stall with a few sweets, but if you go to a T-junction and turn left (there’s a beautiful temple on the corner), it’s just a few shops down on the left. Lighter than barfi, and not so sweet – Milk Cake wouldn’t be out of place with an after-dinner coffee. Incredibly, we ate all this before lunch and I was pretty much in a sugar coma. The main event was on the other side of Chandni Chowk at Adarsh Bhojanalaya at Haider Kuli Corner. Adarsh is a quiet, clean and friendly restaurant which I can imagine being a haven in the warmer months. For 80 rupees, you can eat till you pop – obviously, I was pretty close to popping already so couldn’t really do the deal justice, but I gave it my best shot! The veg thali consists of four dishes – we had pea and cauliflower, a rajma with paneer, a dal and spinach curry cooked in curd and chickpea flour. This was accompanied a non-stop supply of light plain and mixed grain (‘Missi’) rotis and parantha. To finish up there was a soft, sticky gulab jamun. This is a place to come when funds are low and appetite massive. The food was delicious, the service charming and I’m going to be back with an empty stomach soon. 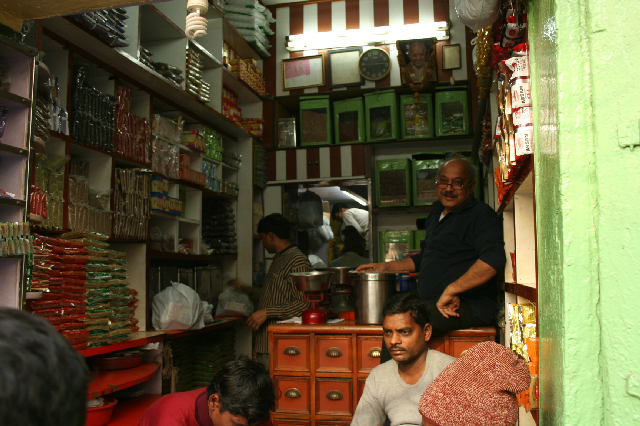 On the way back to the Metro, Rahul took me to his favourite spice shop on Lal Kuan. Again the shop doesn’t have a name but is hard to miss because of the bright green shutters, clamouring crowds, and a jovial-looking proprietor, Mr Sharma sitting at the back. The wooden shutters are a clue to Mr Sharma’s immense popularity in Old Delhi. Since earlier outbreaks of communal violence in the area, most traders now secure themselves with strong metal gates. Mr Sharma has no need for such measures – he knows that for as long as his staff continue to blend masalas for the Muslim Bawarchis (the Old Delhi chefs who buy masalas for their biryanis here) as well as the vegetarian Hindu community, his shop will be safe. In fact, Sharma-ji’s is one of the few establishments never to have been attacked. Mr Sharma, who has also worked for Taj Hotels, packed me off with a bumper bag full of masalas to try at home – very handy for this year’s mission to recreate street food at home, and after this little outing I could be spending a lot of time in the kitchen! We just had time to stop off at Bade Mian’s kheer shop – I know, completely gratuitous gluttony but his kheer is so spectacularly good, I can never resist. In fact, I’m polishing off the last of it as I write this. Apologies for the poor show on the pic front – Rahul keeps up such a cracking pace, there no time for photography let alone quizzing people about their recipes – still, it’s always best to have something to go back for. Wow,never really knew Delhi is such a treasure.Amazing really! Yummylicious post.looking forward for more pics. Thanks Safia – I need to linger a little next time to get the pics! Pamela, I love your blog! I knew there were hundreds of little places out there to try and between reading your blog and following Rahul Verma’s columns I’ll have lots of ideas about where to go. If you’re ever looking for a partner in crime for an exploratory mission, I’ve just moved here and I’m always up for a gastronomic adventure! I too love following your blog!! I’ve been living here for a year now and enjoy exploring all the indian foods. It is so much fun getting all the fun tips on where to go. You are very inspiring. If you ever have the notion to offer a “field trip” to a couple of your blog followers I would certainly sign up! Looking forward to your next blog post. Hi Linda – thanks for your message – ‘field trips’ are difinitely on my mind at the moment – I’ll keep you posted! Thanks Kim – your blog’s looking good too! Sid – it was so nice to meet you the other night – obviously a kindred spirit! I could eat a couple of tandoori parathas tight now! Ever since Hindustan Times featured your blog, i have been hooked. It has been a real eye opener and a real shame that i spent 6 years of med school at MAMC just next door to old Delhi without really exploring these gastronomic treasures. But, better late than never…will be making a trip soon, once the temperatures come down a bit. Thanks and keep up the great work! Thanks for your message – hope you’ll enjoy discovering the food of Old Delhi as much as I have! Had the opportunity to try Jainsaab’s Fruit Sandwiches, and i must say; was pleasantly surprised. The whole combinations just ticks. yesterday 13th July 2012 i went to taste the Moong Dal halva by CHURU in Kucha Mahajani Chandini Chowk. it is inside the small gali in Kucha Mahajani, a tiny 3×6 shop, without any board or number. but not difficult to locate as there was only one such shop in that gali selling sweets. a hanging tiny plastic placard read CHURU WALA and a hand written pamphlet pasted on one side read ‘Moong Dal Halva Rs.450 kg, enough to confirm that i was at the right door. a restless crowd was laying seize around the shop. the supposedly owner dressed in white was almost scolding a nagging customer to wait for his turn. i patiently waited till peace prevailed. the rush appeared to be for some chocolate sweet, which i didnt understand. somehow the owner decided to serve on priority my tiny order of a 250 gm moong dal halva. the absence of floating ghee in the halva was a pleasant surprise, the brown color of halva was remarkably different from the industrial yellow halva we get normally at almost all the shops. And it tasted REALLY GOOD, pure taste of perfectly cooked moong daal with the right balance of ghee and sweet. thanks for your information about this jewel in chandini chowk. Yesterday we tried to follow thw same schedule in evening. I was accompanied with Kulbir one one of my “Twitter” Friend. We missed the Bedmi Poori from Shyam but the mutter kachori with kachaloo sabji was good. It was a nice foodies evening. Thanks for this post.